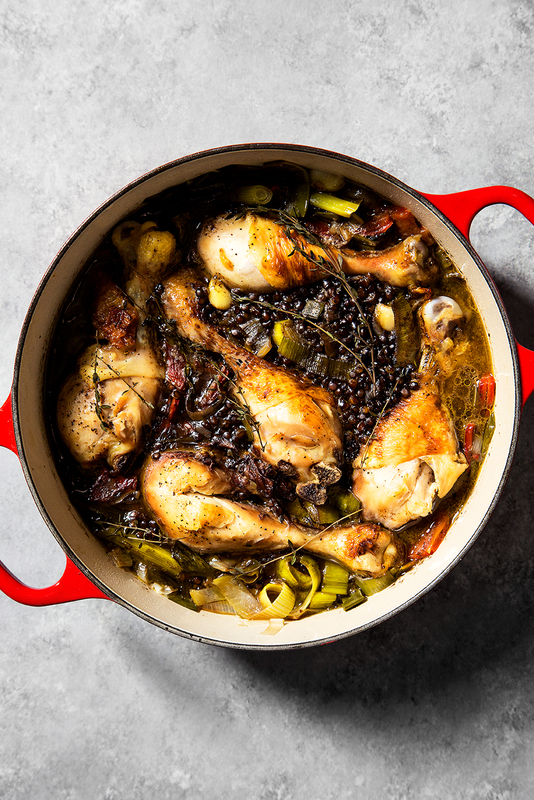 This dish really says “Wow, you’re an ADULT!” I mean, look at it — I made something called “one pot chicken” and it includes lentils, leeks, thyme. It’s a stew! And I cook it in a Dutch oven. Wow. I usually cook 1- or 2-person meals that don’t produce any leftovers. This is one of those dishes that lasts for a few days. I also appreciate the reduced amount of dishwashing to do afterwards: it’s a one pot recipe! If you can’t find black lentils, any lentils will do! 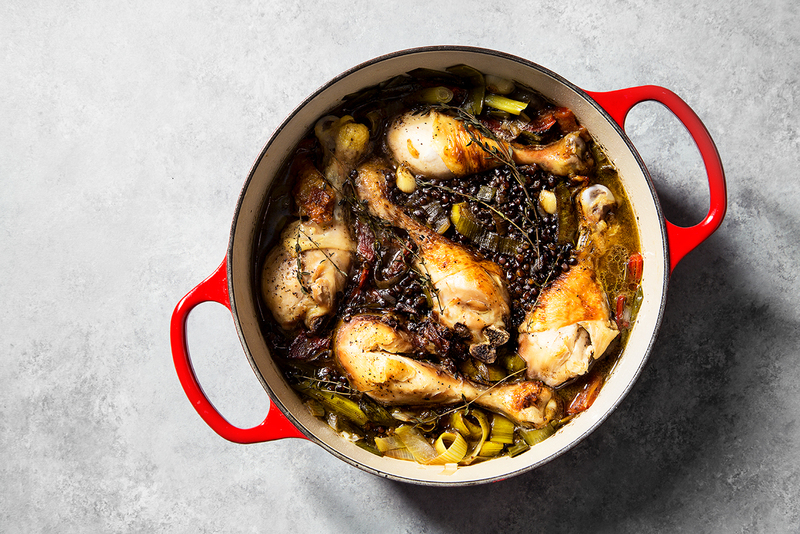 While cooking in a mix of chicken juices and broth with leeks and peppers, they absorb all the rich flavors and turn into the most delicious stew. It’s even better the next day! 1. In a medium Dutch oven or a heavy bottom pot, heat oil over medium high heat. 2. Season drumsticks with salt and pepper, and add to the pot. Cook for about 5 minutes until browned on all sides. Transfer to a plate and set aside. 3. Add garlic, onions and leeks to the pot, stir and cook until softened and translucent. 4. Add lentils, peppers, vinegar and broth, stir everything together and taste for seasoning. Adjust with salt and pepper as necessary. 5. 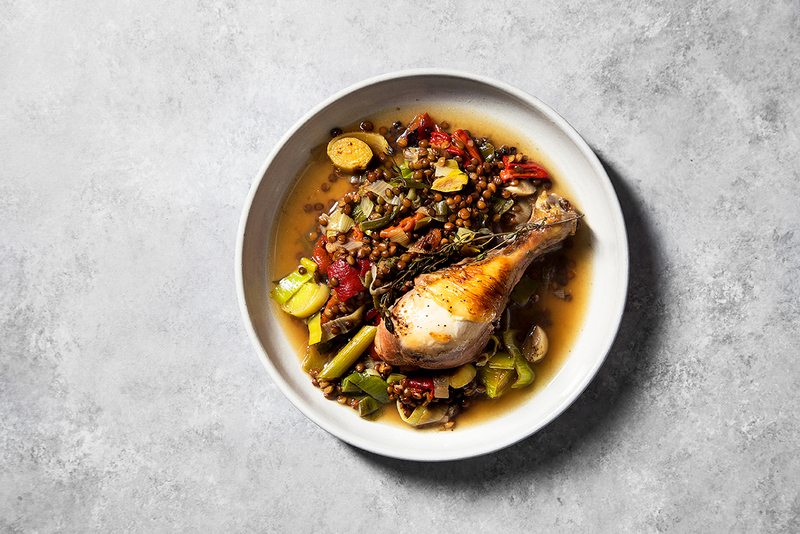 Place the chicken on top of everything, close the lid, lower the heat and cook for about 1 hour until chicken and lentils are cooked through.